Here at Wild Souls we appreciate a trend on the “fringe.” Which basically means, it’s not completely mainstream yet. You might see it on chic fashion bloggers, street fashion photos on Pinterest, or in a one page editorial in Lucky Magazine – but it won’t be in every boutique store window (just yet). This exclusion is what we love about “Fringe Trends”, EVERYONE else isn’t wearing it. We won’t go out in public and see 10 other girls sporting our same “trendy” item… Today we’re featuring one of our favorite “Fringe Trends” of the moment: Herringbone. 1. Black and White Herringbone Print Maxi Dress from Wild Souls. We love the wrap style, as it’s flattering on virtually everyone and the enlarged herringbone pattern is super fun. 2. This girl knows how to layer like a boss! Orange and cream herringbone skirt with knotted belt, chambray shirt, navy cardigan (with the cuffs showing), and cream colored cuff bracelet. 3. J. Crew has done it right with this herringbone vest. The enlarged pattern keeps the look modern and easy to pair, and Caitlin from Southern Curls and Pearls has done a great job pairing it with another great “fringe trend”: elbow patches. You should definitely check out her blog! 4. There is something very classic about a herringbone coat. We love how Alexandria from Lovely Pepa has layered hers with a cute tunic tee, leggings, and other warm/adorable winter accessories like the fuzzy hat, charcoal socks, and Hunter Boots (another excellent “fringe trend”). Check out her blog and post on Hunter Boots. 5. This look by Leslie Tessler is incredibly chic. Loving the idea of a herringbone cape paired with a denim shirt… Also, fantastic white glasses! 6. Another J. Crew herringbone piece done right! We love the idea of a menswear print being mixed with the jewel collar. Pair with the black skirt and you’ve got an ensemble fit for work or play. Today’s OOTD features our “Button Back Tunic with Pockets” (in plum), paired with our hand-painted “Hope Love Key Necklace”, fleece-lined leggings, bangle bracelets, and tan boots. Great outfit for work or play that can be dressed up or down with accessories. Red and Gold were the colors that dominated the Red Carpet in 2014. Hate to say it, but we found the Grammy Red Carpet a bit… underwhelming. Most of our favorite looks are on the simple side, but most of the fashion seemed either “safe” or “tacky”. Not a lot of gowns fell into our favorite “grey area”. With that being said, here are our 12 favorite looks from the Grammy Awards Red Carpet. 12. Natasha Bedingfield’s overall look really worked for her and we love the silhouette of her Christian Siriano own. The only thing is the color… the pumpkin-y orange is sort of drab. If it was more of a coral or peach it could have kicked the look up a notch. 11. We appreciate that Sara Bareilles at least tried to take a risk in her unique gown from Blumarine, and it was about 90 % there- maybe if it was a typical hi-low that came down slightly lower in the front and didn’t have so much train in the back we would have liked it a little more. We DO love the pops of red and the hair!!! 10. Anna Kendrick looked lovely in an Azzaro gown with a plunging corset style front and high slit. The jeweled embellishments compliment the simple silver jewelry and her side swept hair is done just right. 9.Rita Ora’s Lanvin dress was an excellent choice for her. The shimmering green with hints of purple suited her complexion and hair. The mod shift silhouette showed off her gorgeous legs and the simple (but glam) hair and makeup was perfection. We do wish she had opted for a single index ring instead of all the jewelry on her hand. 8. Leave it to Katy Perry to mix it up oh so perfectly at The Grammys! 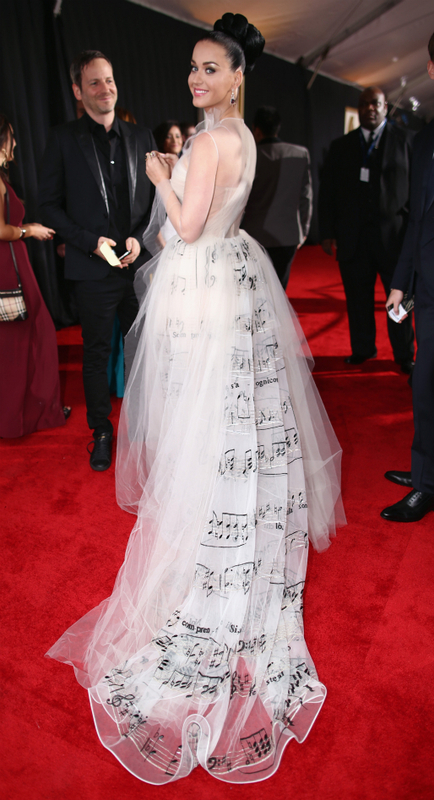 She looked appropriately glamorous in a Valentino Couture gown decorated with music notes. So fabulous! Her high braided bun showed off her gorgeous face without taking away from the highly detailed gown. 7. Ariana Grande’s look was reminiscent of Sarah Jessica Parker with the flouncy floral gown and half-up hair. We love this choice for her for the red carpet. Her ballerina-esque shoes make a perfect pairing. 6. Miranda Lambert’s dress from Pamella Roland looked fantastic on her. We also love her bangles. However, we would have probably changed up the accessories a bit… maybe a silver sparkling clutch and less earrings. In fact, we love the choice of turquoise earrings, but we probably would have left it there with no frames around them. Also, the hair is a little flat, but the side swept style is a great idea. 5. Colbie Caillat looked daring in a red gown by Ezra Santos. Her simple high-bun goes perfectly with the high-neckline of the dress and detailed bodice. 4. Ciara glowed on the red carpet as she showed off her baby bump in a custom Pucci gown. The dark gold sets it apart from other gold dresses from the evening and makes it a bit more interesting. 3. Chrissy Teigen looked flawless in a sparkling gold gown from Johanna Johnson. The “not-overplunging” neckline offsets the high slit in front to perfection and her hair, makeup, and jewelry is just right! 2. Pink looked absolutely STUNNING in a red mermaid gown from Johanna Johnson with textured panels. The princess style corset neckline definitely shows off her arms and her signature haircut has just the right amount of glam. 1. Taylor Swift looked like a seasoned pro on the red carpet in a ridiculously amazing chain-link gown from Gucci Premiere. In our opinion, Miss Swift was miles ahead of everyone else on the red carpet. From her flawless gown to her perfect ponytail and makeup she walked the line perfectly between “safe” and “daring”. Keep it up Taylor! On the 18th of January the lads and lasses of the silver screen donned the red carpet at The Shrine Auditorium in Los Angeles, CA. The lasses were dressed so lovely that it was very hard for us here at Wild Souls to pick our favorites. However, we culled and culled and found our 20 favorite looks for the SAG Awards Red Carpet. What was your favorite look of the night? 20. Ariel Winter showed up looking all grown up in a gorgeous printed Badgley Mischka gown that flowed in hues of blue and violet. Ariel and the rest of the Modern Family group walked away with the win for “Outstanding Performance by an Ensemble in a Comedy Series”. 19. Michelle Dockery joined her fellow Downton Abbey cast mates wearing a tuxedo-esque dress from J. Mendel with a plunging neckline and David Yurman jewels. She and her team were nominated for “Outstanding Performance by an Ensemble in a Drama Series”. 15. Emilia Clarke was perfection from head to toe in a custom Calvin Klein Collection dress and Pomellato jewelry. Emilia was nominated along with her castmates from Game of Thrones for “Outstanding Performance by an Ensemble in a Drama Series”. 14. The unique gown donned by Cate Blanchett on the red carpet takes a pause to truly embrace. At first glance you might feel confused by it, but with each additional look you start to realize the subtle and intricate design that it is a true Givenchy masterpiece! The gown certainly helped shaped the evening for Cate who won the award for “Outstanding Performance by a Female Actor in a Leading Role” for Blue Jasmine. 13. Camila Alves showed up in a breathtaking vintage Donna Karan gown in Support of her husband Matthew McConaughey who was nominated for “Outstanding Performance by a Male Actor in a Leading Role” for his role in Dallas Buyers Club. 12. Isla Fisher proved that Oscar De La Renta is always an excellent choice for the red carpet. Isla was part of the Arrested Development cast nominated for “Outstanding Performance by an Ensemble in a Comedy Series”. 11. Maria Menounos looked gorgeous in a unique Rani Zakhem gown as she showed on the red carpet as a correspondent for Extra. 10. 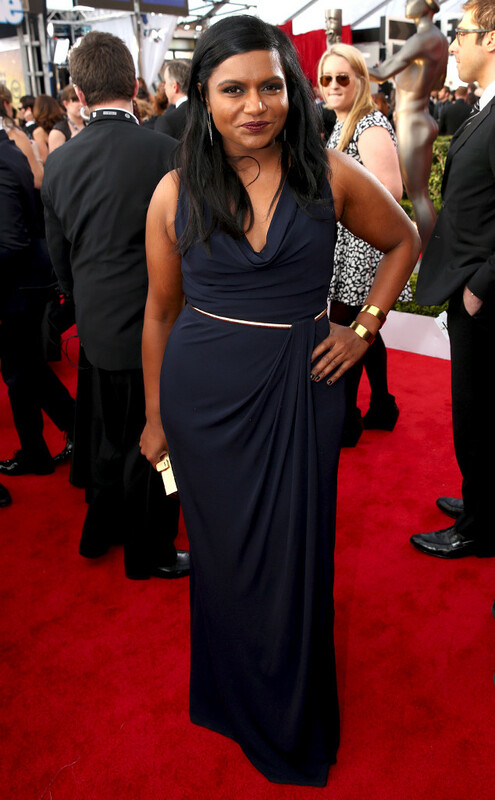 Mindy Kaling looked radiant in a navy cowl neck gown from David Meister who presented with James Marsden. 07. Lupita Nyong’o is proving to be mastress of the red carpet this award season. Her turquoise Gucci gown was a show-stopper and her win for “Female Actor in a Supporting Role” for her memorable performance in 12 Years a Slave was well-deserved. Keep it up Lupita! 06. Kelly Osbourne was head to toe shades of purple on the red carpet with her lavender hair and violet Zac Posen gown. 05.Jennifer Lawrence in sparkling Dior was a vision as she walked the red carpet with her fellow cast mates of American Hustle up for “Outstanding Performance by a Cast in a Motion Picture”. Jennifer also received a single nomination for “Outstanding Performance by a Female Actor in a Supporting Role”. 04. Katrina Bowden sported David Yurman jewels that went perfectly with her unique gown from Badgley Mischka. Katrina, and the rest of the 30 Rock cast was up for “Outstanding Performance by an Ensemble in a Comedy Series”. 03.Amy Adams, you had me at Antonio Berardi! What a fantastic dress: royal blue with an exquisite one-shoulder detail, super high slit, and belt… not to mention her “old hollywood” hairstyle and bold lips. Amy joined the cast of American Hustle in their win for “Outstanding Performance by a Cast in a Motion Picture”. 02. Laura Carmichael is WOWING this awards season on the red carpet. Her sparkling gold Vionnet gown was amazing and looked perfect with her “all-up” top knot. Laura and the rest of the Downton Abbey cast were nominated for “Outstanding Performance by an Ensemble in a Drama Series”. 01. Hannah Simone looked like a 60s Silver Screen Siren on the red carpet in a flowing Marchesa gown. The super pale lavender looked great on her skin tone and her simple makeup and high hair emphasized her soft features. This was just a win all the way around. Keep it up Hannah!